Well, I looked around and saw a couple of club vests and thought it might be a bit of tougher race than last time! Then as I was scanning the other runners kicks I noticed one particular guy wearing Brooks XC spikes – I had a feeling I was looking at the winning pair of shoes right there. So, I lined up on the front row sandwiched between the guy who beat me last time, Mr. White Shirt, and Mr. Spikes and on ‘Go’ we set off at a brisk pace and I was happy that I settled into it quite quickly. The course is not the easiest as after 100m of flat there is an gradual 600m incline before it turns to a 200m flat and then onto the frontside of the course which is a downhill and partially paved. The first klick went by and I had settled into third place. I stuck to the heels Mr. White Shirt and tried to keep whoever was breathing very shallow, rapid breaths behind me at bay! On the downhill of Lap 1 of 3 I went past Mr. White Shirt and up into second and shortly thereafter I went past the leader at that point, Mr. Skin Head. However, at the start of the climb the shallow, rapid breaths of Mr. Spikes came up on my shoulder and began to pull away at a rather astonishing clip! I tried to cover the move but halfway up the incline I decided to drop off the pace a little and was overtaken by Mr. White Shirt! At this point I was battling with myself not to pull out of the thing entirely at 3km – the effort was telling and the second klick was my fastest going by in 3:53. I was quite surprised to find myself in a race! On the frontside, downhill section of Lap 2 I caught Mr. White Shirt and decided to up the pace as I did so – a little racing trick I picked up from Paula Radcliffe’s autobiography! There was no way I had the energy stores to catch Mr. Spikes but I was determined to take home second place and rolled into Lap 3 thinking I might be able to do it. I slowed a little to conserve myself for the incline and then, out of nowhere, there appeared Ms. Road Shoes! I didn’t hear her coming as we rounded onto the incline and she pulled the same trick I did not long before – she upped the pace and I had no choice but to go with it if I wanted a race to the end! Ms. Road Shoes led the way up the incline, onto the flat and then into the final downhill. I could hear that she was giving it everything she had as her breathing sounded pretty hard so I took a deep breathe, braced myself and leaned into the descent lengthening my stride as I did so. I passed around halfway down the descent and with about 500m to go I turned off my brain and stared at the finishing area and the marshalls – I crossed the line in 2nd and then about 7 seconds later Ms. Road Shoes blazed in followed by Mr. Skin Head and then Mr. White Shirt. Ms. Road Shoes took this shortly after we finished. She’s also an ultra-runner with a 50 mile PR of 8:15 from Thames Trot in 2008. 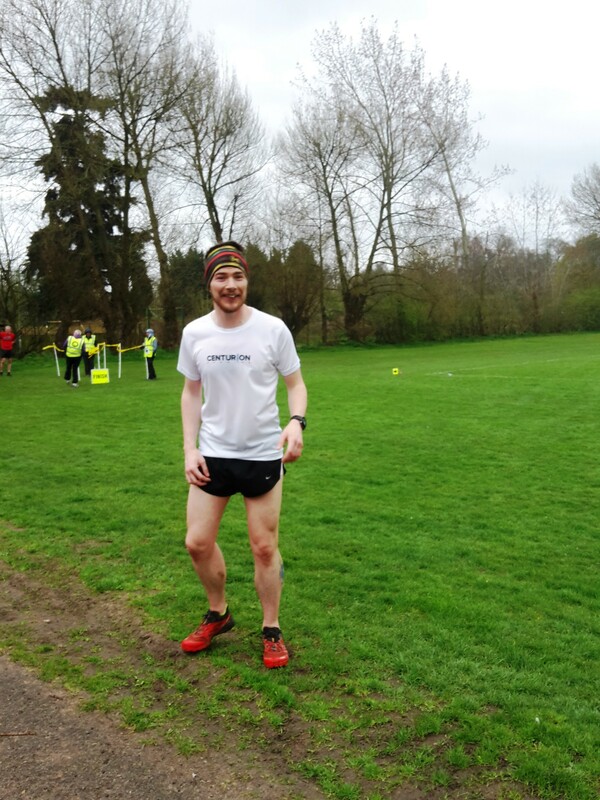 It was a pretty exciting race and I’m pleased with a 2nd place finish…but I will return to South Oxhey parkrun and I will win!! This entry was posted in Post on Apr 11, 2015 by Al Flowers.